Polish native: "Face of Thailand is changing"
Bangkok, Thailand (CNN) -- Some Bangkok residents ventured out on Thursday to shop and take stock of the damage done to their city one day after the government evicted thousands of anti-government protesters from a downtown district, triggering fires, riots and intense street battles. Some shoppers at the Emporium mall -- which was not set on fire like the popular Central World mall -- drank lattes, got their hair styled or perused books. But one sign reminded them that the venue would close at 6 p.m. to leave enough time for patrons to get home ahead of a second night of a citywide curfew. "I feel very upset. I can't believe this happened in Thailand. Killing is not acceptable in Buddhism," said Siripattra Sitisak, a 30-year-old hotelier. "I'm nervous about attacks from underground organizations that might bomb other buildings or set fire to them." Another mall patron, Bogna Szukalska, a 25-year-old from Poland who has lived in Bangkok for four years, said Wednesday's events showed the "face of Thailand is changing." When she first came here as a student, "it was to have a relaxed and good time in a safe country. It was rare to see any aggression between Thais or against foreigners," she said. "Now, I'm just very shocked. I and two of my other friends are thinking of leaving the country. It's not the Thailand we know anymore." "It's not the Thailand we know anymore." On Wednesday, the army surged into Lumpini Park, the area where anti-government protesters, known as the "Red Shirts," had amassed in the thousands over the last few months. After hours of intense street battles, seven Red Shirt leaders were taken into custody. Red Shirt leaders called off the protest, but it seemed as though many did not heed the call. Smaller riots erupted throughout the city. A dozen buildings -- including a bank, a police station, a local television station and Central World, the country's biggest shopping mall -- were set ablaze. In all, 34 buildings were torched, a government spokesman said. At least 44 people have been killed in clashes in the last several weeks, and nearly 400 people were injured, government officials said. What are the protests about? Government officials extended a dusk-to-dawn curfew until Sunday in the hopes that their crackdown on protesters would hold. Justin Dunne, general manager of a popular Bangkok restaurant and bar, on Thursday took a taxi ride down to the protest area --- which proved a sharp contrast to his fairly quiet neighborhood. "The overall feeling is just a ghost town, and we should probably move along very quickly," he said. By the time he got to Lumpini Park, he wanted to get home. "You've got military vehicles in the road, you've got tanks down there, it's filthy. It feels unsafe," he said, noting there was debris such as bamboo sticks and tires, and there were few people. In another part of Bangkok, Rujira Jeawskun, a 22-year-old international coordinator for a travel firm, said she went out Thursday in her neighborhood to buy groceries. "There are people going out to live their lives too, but it's not that busy or so crowded like the normal Bangkok," she said, noting that the main topics among her neighbors were the Red Shirts and the Central World Mall fire. "I have to say that I'm no Red Shirt, I'm not Yellow Shirt (opposed to former Prime Minister Thaksin Shinawatra). I'm not with any shirts. But I just feel so sad. How can people who are asking for democracy burn our country like that?" Back at the Emporium. Jakaphom Boonyai, a salesman there, said he felt better since the government was more in control. "As for the next few days, I'm 50-50 -- I won't be surprised if some violence will still break out. I'm watching the latest news updates as much as I can to know what's going on out there." Jeawskun said she was not optimistic that residents would come back together any time soon. "I think putting the city back together, mentally, will be long. ...Our feeling is not the same anymore. Can we trust others since on the news we saw Thai people who did hurtful things to Thailand?" she said. "Maybe rebuilding the city might be quick, but the understanding between Thai people might take a long time." CNN's Miranda Leitsinger contributed to this report. Weerachai Khonlar was ferrying passengers to a Buddhist temple in the protest zone when shots rang out. 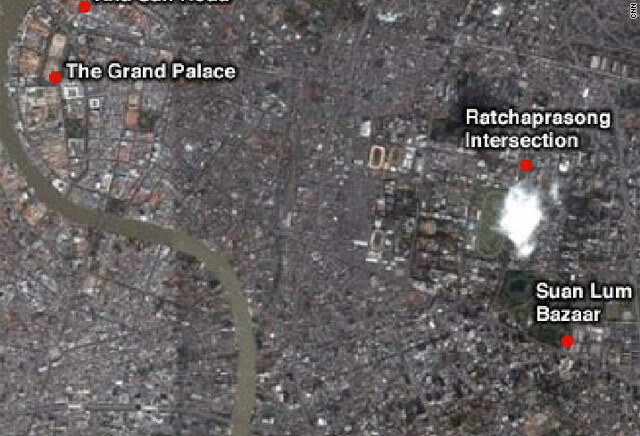 The violent clashes in Bangkok follows years of political instability and unrest in Thailand.